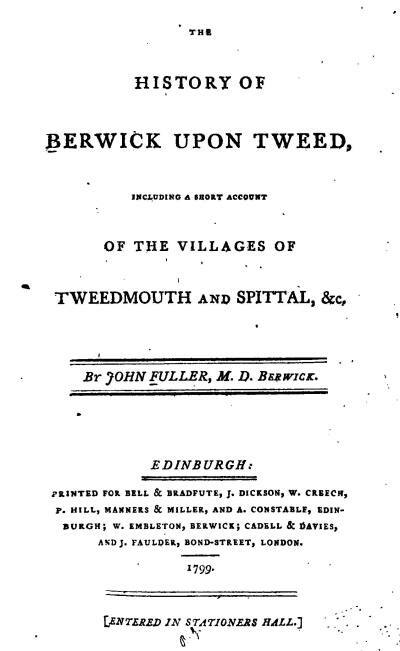 A number of the older published histories of Berwick-upon-Tweed, and in some cases a much wider area of Northumberland and Durham, have been made available online in digitised versions. Most of the titles listed below can be consulted on the Internet Archive website. Within each volume, a keyword search facility allows you to pinpoint the references to a specific topic. Click the highlighted titles to see the volume. John Scott. Berwick-upon-Tweed: the history of town and guild. 1888. 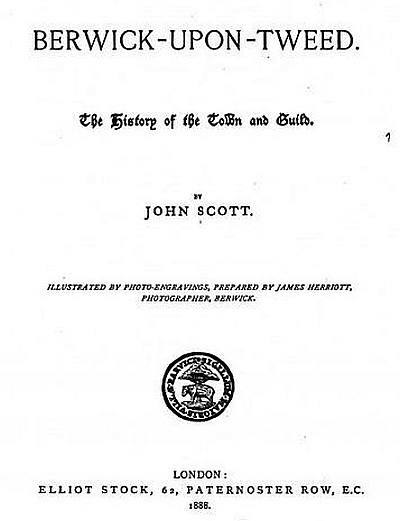 A general history of Berwick-upon-Tweed, from the earliest records as well with the history of the Guild. T. Fordyce. Local records; or, Historical register of remarkable events which have occurred in Northumberland and Durham, Newcastle-upon-Tyne and Berwick-upon-Tweed…. 1867-1876. William Whellan & Co. History, topography, and directory of Northumberland. 1855. Comprising a general survey of the county, and a history of the town and county of Newcastle-upon-Tyne, with separate historical, statistical, and descriptive sketches of the boroughs of Gateshead and Berwick-upon-Tweed, and all the towns … wards, and manors. To which is subjoined a list of the seats of the nobility and gentry. Frederick Sheldon. History of Berwick-upon-Tweed. 1849. Eneas Mackenzie. An historical, topographical, and descriptive view of the county of Northumberland … and Durham … with Berwick upon Tweed …; 2nd edition. 1825. Most of the material on Berwick and North Northumberland appears in Volume 1. A directory and concise history of Berwick-upon-Tweed; printed by W. Lochhead. 1806. This is an indexed web edition of the earliest printed directory of Berwick, prepared by Gavin Cairns. John Fuller. The history of Berwick upon Tweed. 1799. The history of Berwick-upon-Tweed, includes a short account of the villages of Tweedmouth and Spittal. Christopher Atkinson. The emigrant’s guide to New Brunswick, British North America. 1842. This guide published in 1842 was written by the Rev. Christ. Atkinson, Minister of the Gospel, College Place, Berwick. He was formerly the pastor of Mascreen Kirk, St. George, New Brunswick. Many people from North Northumberland and Lowland Scotland emigrated to New Brunswick in the 1830s. Hubert E. H. Jerningham. Norham Castle. 1833. A comprehensive guide to the history of Norham Castle, and the surrounding area. From the introduction of Christianity to Norhamshire, the border battles, and the various Kings of England and Scotland.